When I teach people how to forage for wild plants most individuals find it fun yet rather overwhelming with all the new information. Yes, it is overwhelming if you look at an entire field or forest wanting to know everything that is edible. It is so much easier to make a square, let’s say a 4’x4’ area, and learn what is in that square first before moving onward. What truly helps in the identification process is getting to know the most common plant families first. In my opinion, the best book on the market for this is Botany in a Day. 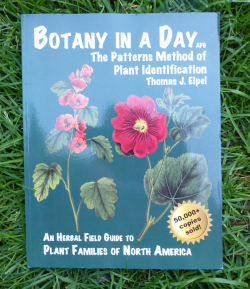 Botany in a Day has changed the way people learn about plants and author Thomas J. Elpel is the mastermind and author behind this incredible learning tool. He has transformed the ability for people to identify one plant at a time to learning several plants at a time. Related plants have similar characteristics and they usually have similar uses as well. Each family of related plants have unique patterns for identification and Thomas has made learning these characteristics fun. In June 2013 Thomas released the sixth edition of this book with 235 colourful pages. This edition includes additional work not in previous editions and it is printed with soy-based inks on recycled paper. Thomas gives the perspective of the entire plant kingdom (and where it fits into all living things) and its history. He includes information to identifying non-flowering plants as well as flowering plants. In addition, there is identification information about trees and ferns. Botany in a Day is written well and there is not a doubt that Thomas’ passion for botany comes through in this book. He uses his own experience in tasting and experimenting with plants to give you a really good sense of what the plants are like and he lets the reader know what is edible and includes a brief overview on the medicinal qualities. By learning a few simple family plant patterns you can recognize and utilize plants by knowing their characteristics, even if you haven’t a clue what the common name of the plant is. Botany in a Day is principally written for those in the U.S. and Canada, but it is enjoyed by people in many countries. In fact, this book is so well-sought after that it is used as a textbook in numerous universities, high schools, and herbal schools. It is also used in nature programs and promoted in national parks. Whether you are a diehard forager, new to the incredible world of edible and medicinal plants, or if you simply just want to increase your knowledge about plant families then this is a must-have book that you’ll love the moment you receive it. Thomas J. Elpel has authored other notable books you may be interested in. Shanleya’s Quest is an amazing book about an incredibly fun botany adventure that is sure to capture the attention of those ages 9 to 99. I’m a Medicine Woman Too is a fabulous book to connect children with herbal traditions. The story role-models an ethic of healing and caring for other people and honouring our elders. The delightful illustrations touch the reader at an emotional level, compelling us to become healers too. If you’re interested in owning your own copy of Botany in a Day please visit our store page. For other Thomas J. Elpel books please click here. Can’t wait to read this book, just bought it from the link you posted on your website. Thanks Vanessa! It is a truly incredible book! I just bought it! Used your link in your store. I’ve been wanting to order this for a couple years now. Pretty excited for it to come in. You won’t be disappointed Travis – it is truly a fabulous book!